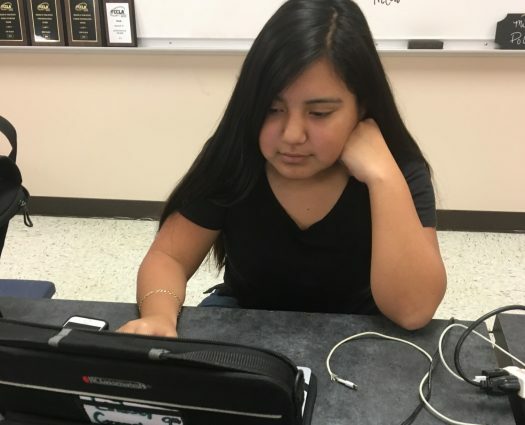 Lindsey Gonzalez works on her Chromebook for an assignment in PHS class. Painting in her free time is just one of many hobbies that freshman Lindsey Gonzalez has. Gonzalez paints anything that comes to her head, and she gives the finished artwork to people as surprise gifts. Over the weekend the FCCLA went to a contest and Gonzalez and her teammate Yomele Almeida won second place in Interpersonal communication. Getting second place made her get a chance to go to state in that event. As well as being in FCCLA, Gonzalez participates in Belles. During her time in Belles she has helped her teammates get better at their dances. Next year Gonzalez will be trying out for officer.